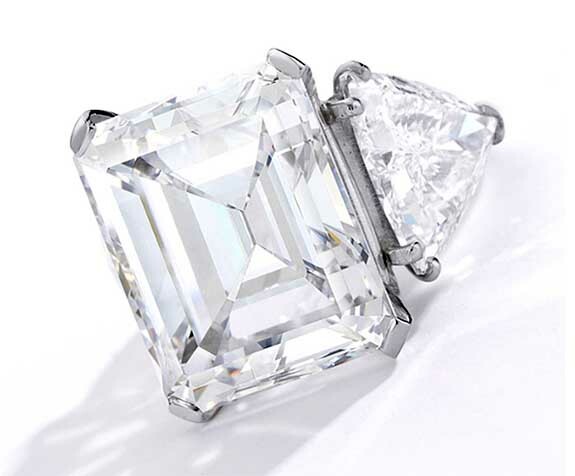 The 20.6-carat emerald-cut diamond ring that Frank Sinatra famously presented to fourth wife, Barbara, in a glass of champagne is the top jewelry item in a series of upcoming Sotheby’s auctions focusing on the treasures gathered by the couple during their 22-year marriage. The legendary singer had met Barbara in the early 1960s, but they didn’t start dating until 10 years later. When Frank was finally ready to cement the relationship after a turbulent four-year courtship, he reportedly tossed two huge diamonds onto the bed told Barbara to pick one. The emerald-cut diamond was her favorite, so Frank had a jeweler set the stone in a platinum ring accented with triangular-cut side stones. Ever the romantic, Frank decided to forgo the traditional box and surprised Barbara by submerging the diamond ring in a glass of champagne. According to Sotheby’s, Frank hadn’t offered a formal proposal, so the engagement was only official after Barbara made him choose which finger to put it on. The couple married in Palm Springs in 1976. Frank was 60 and Barbara was 49. Barbara’s ring will hit the auction block at Sotheby’s New York with a pre-sale high estimate of $1.5 million. It’s one of 200 lots grouped under the banner of “Lady Blue Eyes: Property of Barbara and Frank Sinatra.” Items range from artwork and show memorabilia to jewels and objects from their home. Sotheby’s believes the 200 lots should yield at least $3.5 million. Frank Sinatra passed away in 1998 at the age of 82. 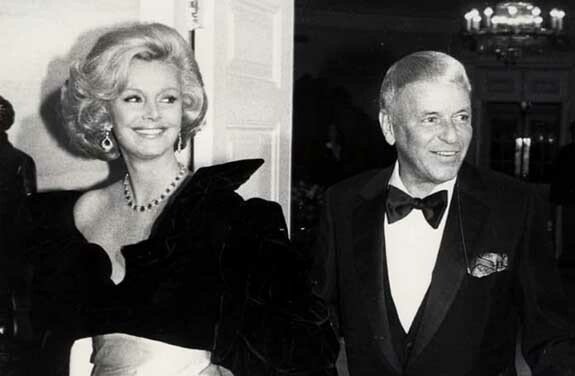 Barbara Sinatra died in July of 2017. She was 90.
Credit: Jewelry image courtesy of Sotheby’s. Frank and Barbara Sinatra photo courtesy the Estate of Barbara Sinatra.